HIBERNIA BANK – 1 JONES ST. Despite longtime neglect and abuse, the old Hibernia Bank is still beautiful and is certainly one of the most historically significant buildings in the central city. Its condition has substantially deteriorated in recent years, much to our shame. The current owner, Professor Lin-Yun, Supreme Leader of Black Sect Tantric Buddhism At Its Fourth Stage, purchased the building in 1995, stating a desire to transform it into a Buddhist temple and school. The reason he has not done this, he claims, is that the building is in "a bad neighborhood" — a strangely unenlightened mindset. Professor Lin-Yun is willing to sell, however. His asking price: twenty million dollars, twenty times the assessed value of the building when he purchased it. Renovation and retrofitting had just begun when I took this and several other photographs of the Gates and its wonderful sign. The sign is an example of a very distinctive Deco motif (see Yale and Sunset - The Alder), popular in the 1920's, that was used on various residential and one-time tourist hotel signs scattered throughout The City. HILLSDALE HOTEL – 51 6TH ST. I find poignant beauty in buildings and locales that most people consider ugly, squalid eyesores. Our deepest emotional chords, those that send a chill up the spine when struck, are directly linked to some part of ourselves that is far older than we are in our present lifetime. I am an adrenaline junkie and savor the rush of neurochemical activity that occurs when I connect with something that is archetypal. It makes me feel electric and alive. These old buildings have this archetypal quality that stirs my blood. They have an attraction that is powerful and magnetic. So many people, so many stories, so much living has taken place within their walls. How can you not feel it? We are far too willing to dispose of anything that is old just because we are told that new things are somehow better. I would ask why we are being told this. Who, really, is the beneficiary when we destroy our history? SUNSET HOTEL – 161 6TH ST. I like to call this image iconic, meaning it represents for me everything that falls into a particular category, as well as being an image that can stand on its own merits. 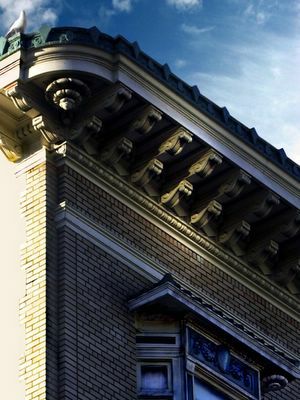 The picture shows a small section of the cornice that crowns the Sunset Hotel on 6th Street. I like it for a number of reasons, not the least of which is that its overall design is very simple. I also like the very large dentils and the medallion that decorates the end of the cornice. Rust reveals that it is a metal fabrication and not carved stone. Simplicity and neglect combine to make this architectural detail a perfect symbol for all old residential hotels. I have included this picture because, although it lacks the other picture's élan, it reveals interesting details that A Lost Art leaves out. ALKAIN HOTEL – 948 MISSION ST. This is the rear of the Alkain Hotel, as seen from Jessie Alley. Jessie Alley is in San Francisco's 6th Street district, once known as skid row. Tradition has it that the alleys in this area were named for some of the more popular, or perhaps notorious, prostitutes who plied their trade in this part of town back in the days when the City was young, wide-open and lawless. It may be apocryphal, but some of the alleys do have names such as Jessie, Harriet, Clara, Mary, etc. HAVELI, WHITAKER & OAK TREE HOTELS – 37, 41 & 45 6TH ST. This image of a wet evening in late autumn, shot from the fire escape of my old hotel, is for me a living image. I hear the sounds of traffic on wet pavement, footfalls on the sidewalks and the faint staccato of light rainfall. The traffic whizzes by in a darkening world that feels so comforting to me, as though Mother Earth were pulling up the blanket around my chin for the night. ADRIAN HOTEL – 493 EDDY ST. I had been taking pictures of various neon hotel signs and the Adrian Hotel, on the corner of Hyde and Eddy Streets, was my last stop. It was not an easy sign to capture. The brightly flood-lit signs of the corner store below and a streetlight and poles for the overhead trolley lines kept me from getting the angle that I wanted. I didn't like any of the shots I tried. As the morning grew brighter with pre-dawn light, my attention was drawn to an open window next to the sign. Now I had my shot. Satisfied at last, I headed home and on the way discovered the opportunity to capture Dawn Over Taylor Street. LASSEN APARTMENTS - 441 ELLIS ST.
(formerly Hotel Adair) c.1915. Architect: J.R. Miller. 6 stories, brick & terracotta facade, remodeled aluminum cornice. While taking a morning walk through the Tenderloin in search of subject matter, I was enjoying the light as the orb of the sun rose above the horizon and into the sky. The air was so incredibly clear that objects had a presence and a feeling of three-dimensional realness that is hard to describe. I remember that my path that morning was circuitous. Sometimes I let my feet make their own decisions without any conscious directive. Walking downhill on Jones Street and reaching the corner of Ellis, my feet turned right and headed west. I often have my eyes pointed upward because that is where many of my more interesting discoveries have been made. The first thing I saw on rounding the corner was the sunlight reflected onto this beautiful cornice, showing details that would normally be completely lost in shadow. The image that I managed to capture conveys something of that morning's crystalline clarity. HOTEL HARTLAND – 909 GEARY ST.
1913. Architect: Rousseau & Rousseau. 6 stories, brick & galvanized iron facade, milk glass base, entry remodeled. By the time I got around to photographing the Hartland’s sign, I had photographed most of the hotel signs in the central city area that I thought were worth photographing. I included the Woerner’s Liquor Store signs in this shot to balance the drab, narrow vertical of the Hartland’s unkempt sign. This is the service entrance of a unique Market Street business that first opened its doors in the 1960s and closed them for the final time in 2003. The name of this enterprise was "Fascination." It was a kind of midway arcade game located on the main thoroughfare of San Francisco. The fact that "Fascination" was a successful business for all of those years is an indication of the steady, if not devoted, patronage of its clientele. Most of them were tenants of the many surrounding residential hotels. The day that I took this picture promised to be beautiful and sunny. The early morning fog was already starting to burn away with the rising of the sun, exposing more blue sky by the minute and signaling the impending demise of the dawn's pink light. I took many pictures of this building that morning. This picture is one of two (see Back Alley Transfiguration) that captured what I was after. Although the once-elegant entrance to the hotel has been ruined by a security gate, hand painted legends of "HOTEL" in yellow on either side of the entry, a red and white sign of painted plywood hanging from chains and the removal of entrance lamps (though not of the bolts that once held them in place), one can still get a feeling for what a handsome building the Marathon was in its heyday by taking in the Ellis Street facade as a whole. A building doesn't have to be decrepit, decayed or neglected in order to stir my interest. 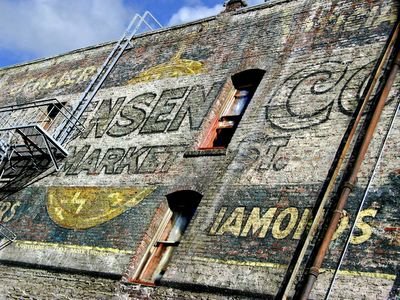 When a building has been around for a while it shows signs of time's passage, revealing its history in a wonderfully arcane visual language. What I captured with my camera in this picture can't be seen from street level. It is a hidden world. With the new skyscrapers in the distance, this image symbolizes for me what is happening to all cities in the world today. In order to photograph this very old ad painted on the side of the Helen Hotel it was necessary for me to position my camera's lens against a chainlink fence and shoot through an opening between the links. The fence is orthogonal to the wall, the ad is very long and the fence very short, which meant that I could only capture the ad at a very acute angle. There was no way I could get the wall to "stand up straight". At first this bothered me, but the more I looked at this particular shot, the more it grew on me, until at last I found it difficult to imagine seeing it any other way. Looking across Jessie Alley from the fire escape of my old hotel, one sees the Lawrence Hotel. 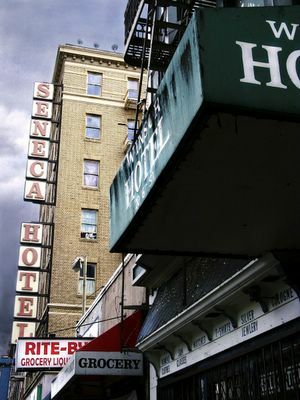 A small part of the Seneca Hotel can be seen in the background and in the distance is the old Empire Hotel, now rental housing for students at Hastings College of the Law. While photographing the Gates, I couldn't get an unobstructed view of the entire facade without standing in the middle of the very busy street. I eventually wound up with my back against the Parc Renaissance Hotel, where the traffic signals were about four or five feet away and directly between me and the Hotel Gates. It seemed appropriate to have the traffic signals looming large and impertinently in the foreground to reflect how crowded the intersection was that day. WINSOR & SENECA HOTELS – 20 & 34 6TH ST.
Next door to the Winsor Hotel is the bar formerly known as The Charleston. A portion of the sign for Grady's, a bar that once opened into the lobby of the Seneca Hotel, is visible in the lower left corner. A long-standing, very common misconception held that these places were little more than sordid hangouts for down-and-out alcoholics, when in fact they were important social hubs for the neighborhood's older residents, serving as living room and even dining room for folks whose homes consisted of a single, small room. Grady's closed its doors for the last time on St. Patrick's Day, 2002, followed by The Charleston later the same year, leaving many of the community's seniors without a place where they could meet and socialize. Since then, nothing has been done to address that need. Their social life erased, it is as if these people never existed. They are rarely, if ever, seen anymore. All that is left for them is the solitude of their lonely rooms. ABANDONED FIRE STATION – JESSIE @ MINT ST. This wall, which to me appeared organic and alive, is the facade of a closed-down fire station, located across Jessie St. from the Old Mint. In the time since I took this photograph, the building has been restored and transformed into upscale lofts by the Martin Building Company. The old wall lives on, however; a large print of this photograph now hangs in The Martin Building Company's main offices. RIVEIRA HOTEL - 420 JONES ST.
(formerly Avon Hotel). 1907. Architects: Crim & Scott. 4 stories, brick facade, aluminum sash & door. The Riveira (sic!) is the brown building with yellow trim in the background of this photograph, one of my favorite images. The day I tried to photograph the hotel I couldn't find a vantage that pleased me. As I moved about, trying to find an angle and perspective that worked, I began to hear the clangorous, but muffled sound of drums and gongs being pounded in erratic syncopation, with a rising and falling intensity, like Chinese lion dance music. I was irresistibly drawn around the corner onto Ellis St. to the music’s source — an odd, little building that had often piqued my curiosity. What grabbed me was the low hood that projected outward from the building’s façade. Here was an architectural detail with presence and a personality! It was so patently home-made, with loving attention paid to form and style, but constructed with the cheapest and strangest of materials. The "barrel tiles" were aluminum soft drink cans, covered with what appeared to be cardboard, and the plywood was clearly interior grade. Yet the colors were always kept bright with periodic coats of fresh paint; a sign of care that I found truly endearing. I had to photograph it; and thus I found the way to frame the Riveira. A short time after I captured this image, the little building was leveled by a bulldozer and the lot has remained empty ever since. HOTEL MENTONE – 387 ELLIS ST.
Across the street from the Riveira Hotel is the Hotel Mentone. I have always found the name "Mentone" somewhat amusing. It brings up images of steamy locker rooms and old-fashioned gyms smelling of sweat. The hotel has been repainted on the outside and renovated on the inside since I took this photograph. It looks more dignified now, but nowhere near as interesting as it used to look. Fortunately, the unique lettering of the signs has been preserved. 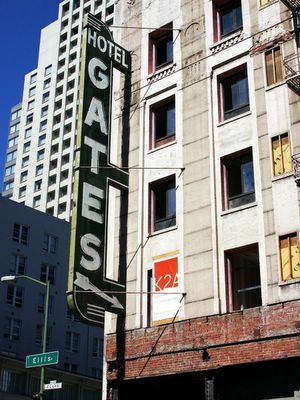 It is a link to the past; a time when more San Franciscans lived in residential hotels than in any other type of domicile.